Quilting shapes can be used as inspiration for the quilting designs on a project or for the shape of the project itself. Heather Thomas shows you how to make fun shaped wall art pieces using layers of thick fabric and stabilizer, and then cutting them into any desired quilting shape. For this quilting project you can use a printed fabric as your background piece or, as Heather demonstrates, you can make a layered background using lots of small pieces of fabric. Heather shows how to adhere all of the small fabric pieces together using a fusible interfacing. For the backing of this project Heather uses a thicker fabric than what would normally be used for a bed quilt. She explains what type of fabric to use as well as talks about other ways to make the quilt thicker including using a stiff stabilizer. 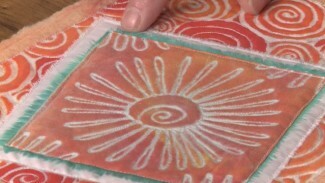 Heather then talks about different embellishments that can be used on this project. She shows how to use small bits of thread to create texture on the quilt surface and how to add shimmer by creating your own angelina fabric. Once all of the fabric layers have been created and laid together it’s time to add the quilting. Heather explains how to do a close together stipple design over the entire piece. After the quilting is done the quilting shape can be cut. You can either free hand a design or make a template to use. After being cut Heather explains how to finish the edges of the quilting shape using a zig-zag stitch first and then a satin stitch. 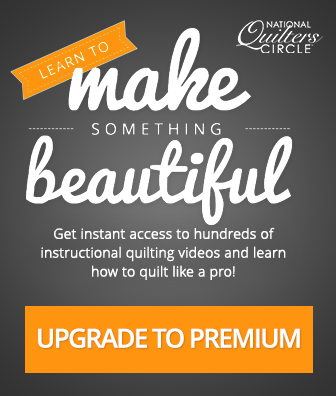 If you choose to use a flower quilting shape like Heather, she shows several different ways you can create a fun, decorative center. She also gives several other shape options for other quilted gift ideas. Paper piece projects look beautiful and can be rewarding, but usually the fabric is cut too big or too small. 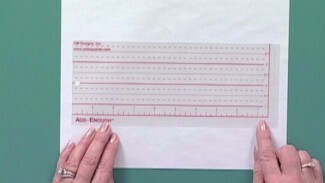 Carolyn McCormick gives you tips and tricks about how big to cut pieces using an add enough ruler. This tool will let you cut squares rectangles, or half square triangles.